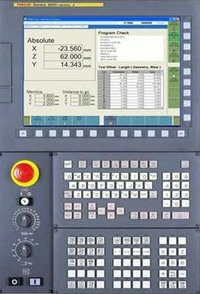 Fanuc G85 Boring Cycle is also called Fanuc G85 Reaming Cycle. As Fanuc G85 boring cycle can be used for Reaming operation. Tool traverses down to end depth with feed and retracts the withdrawal plane with feed. Z – Boring depth (Absolute). R – Tool starting position above the hole. 1 – After positioning along X and Y axis, rapid traverse is performed to point R.
2 – Boring/Reaming is performed from point R to end-depth-point Z with specified feed F.
3 – After completing depth Z with feed F, Tool returns with the same feed F.
Return plane is dependant on G98, G99 G-codes. If G98 is specified with G85 boring cycle the tool returns to Initial-level. 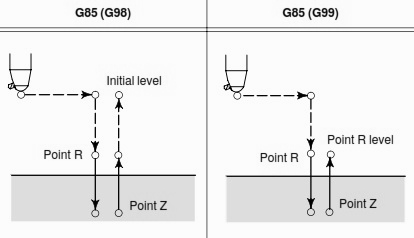 If G99 is specified then tool will return to R level. G90 G99 G85 X300. Y–250. Z–150. R–120. F120.